"I compel the loyalty of all new flesh / Huge and furious in its hunger / That which may not otherwise be commanded / My death is hidden in this sport." Kagoor is a Taken Wizard that appears as a boss in the Court of Oryx. 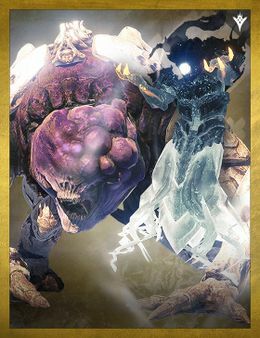 Regarded as a master in the creation and taming of Hive Ogres, She is accompanied and protected by a Servile Ogre that must be destroyed in order to make her vulnerable to Guardian attacks. Kagoor is a very difficult boss to tackle. Her Necromantic Gaze is difficult to dodge. She will summon endless waves of Ogres, Malificent Eyes (a stronger variant of Acolyte's Eyes), and Devoured Shadows (a stronger variant of Shadow Thralls). Killing the Maleficent Eyes, however, will grant Guardians a buff called "Ogre's Fury", which will greatly boost damage against Ogres, even the Servile Ogre, which must be killed in order to disable Kagoor's shield. Once the Servile Ogre is down, every Guardian on the battlefield must attack Kagoor with everything they have: weapons, Supers, grenades. Otherwise, another Servile Ogre will reappear, and players will need to repeat the process again. It is possible to defeat Kagoor if the Servile Ogre appears a second time, but Guardians must be quick. The Gravetide Summoner encountered as a Weekly Bounty by The Spider use similar mechanics to Kagoor. She can only be damaged when her Gravetide Ogre is killed.